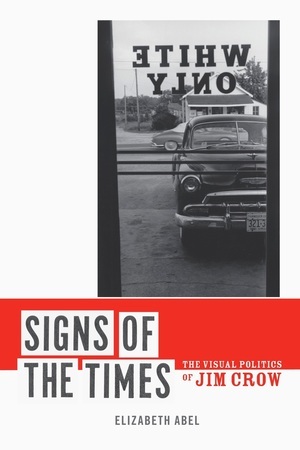 Signs of the Times traces the career of Jim Crow signs—simplified in cultural memory to the “colored/white” labels that demarcated the public spaces of the American South—from their intellectual and political origins in the second half of the nineteenth century through their dismantling by civil rights activists in the 1960s and ’70s. In this beautifully written, meticulously researched book, Elizabeth Abel assembles a variegated archive of segregation signs and photographs that translated a set of regional practices into a national conversation about race. Abel also brilliantly investigates the semiotic system through which segregation worked to reveal how the signs functioned in particular spaces and contexts that shifted the grounds of race from the somatic to the social sphere. Elizabeth Abel is Professor of English at the University of California, Berkeley, and the author and editor of several books, including Writing and Sexual Difference, Virginia Woolf and the Fictions of Psychoanalysis, and (with Barbara Christian and Helene Moglen) Female Subjects in Black and White (UC Press).